Isotopes of atmospheric O2 undergo millennial-scale variations during the last glacial period, and systematically increase during Heinrich stadials. Such variations are mostly due to vegetation and water cycle processes. Our modeling approach reproduces the main observed features of Heinrich stadials in terms of climate, vegetation and rainfall. It highlights the strong role of hydrology on O2 isotopes, which can be seen as a global integrator of precipitation changes over vegetated areas. Alley, R. B., Anandakrishnan, S., and Jung, P.: Stochastic Resonance in the North Atlantic, Paleoceanography, 16, 190–198, 2001. 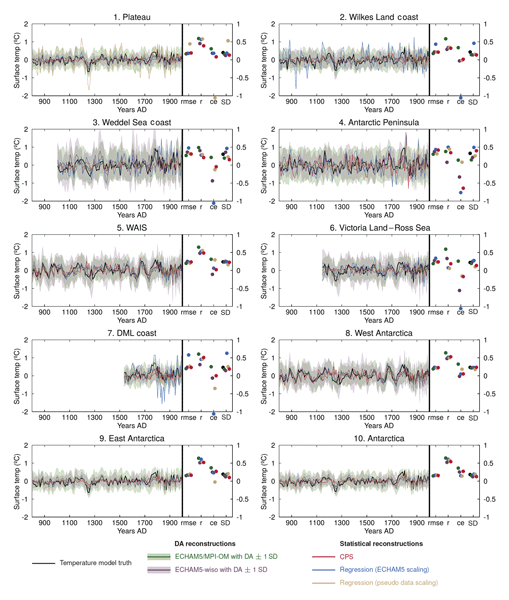 Braun, H., Christl, M., Rahmstorf, S., Ganopolski, A., Mangini, A., Kubatzki, C., Roth, K., and Kromer, B.: Possible solar origin of the 1,470-year glacial climate cycle demonstrated in a coupled model, Nature, 438, 208–211, 2005. Braun, H., Ganopolski, A., Christl, M., and Chialvo, D. R.: A simple conceptual model of abrupt glacial climate events, Nonlin. Processes Geophys., 14, 709–721, https://doi.org/10.5194/npg-14-709-2007, 2007. Braun, H., Ditlevsen, P., Kurths, J., and Mudelsee, M.: Limitations of red noise in analysing Dansgaard-Oeschger events, Clim. Past, 6, 85–92, https://doi.org/10.5194/cp-6-85-2010, 2010. Buizert, C. and Schmittner, A.: Southern Ocean control of glacial AMOC stability and Dansgaard-Oeschger interstadial duration, Paleoceanography, 30, 1595–1612, 2015. Ditlevsen, P. D., Kristensen, M. S., and Andersen, K. K.: The Recurrence Time of Dansgaard-Oeschger Events and Limits on the Possible Periodic Component, J. Climate, 18, 2594–2603, 2005. Ditlevsen, P. D., Andersen, K. K., and Svensson, A.: The DO-climate events are probably noise induced: statistical investigation of the claimed 1470 years cycle, Clim. Past, 3, 129–134, https://doi.org/10.5194/cp-3-129-2007, 2007. Dokken, T. M., Nisancioglu, K. H., Li, C., Battisti, D. S., and Kissel, C.: Dansgaard-Oeschger cycles: Interactions between ocean and sea ice intrinsic to the Nordic seas, Paleoceanography, 28, 491–502, 2013. Drijfhout, S., Gleeson, E., Dijkstra, H. A., and Livina, V.: Spontaneous abrupt climate change due to an atmospheric blocking-sea-ice-ocean feedback in an unforced climate model simulation, P. Natl. Acad. Sci. USA, 110, 19713–19718, 2013. Grootes, P. M. and Stuiver, M.: Oxygen 18/16 variability in Greenland snow and ice with 10−3 to 105-year time resolution, J. Geophys. Res., 102, 26455–26470, 1997. Kawamura, K., Abe-Ouchi, A., Motoyama, H. et al. : State dependence of climatic instability over the past 720,000 years from Antarctic ice cores and climate modeling, Sci. Adv., 3, e1600446, https://doi.org/10.1126/sciadv.1600446, 2017. Kleppin, H., Jochum, M., Otto-Bliesner, B., Shields, C. A., and Yeager, S.: Stochastic Atmospheric Forcing as a Cause of Greenland Climate Transitions, J. Climate, 28, 7741–7763, 2015. Mitsui, T. and Crucifix, M.: Influence of external forcings on abrupt millennialscale climate changes: a statistical modelling study, Clim. Dyn., 48, 2729, https://doi.org/10.1007/s00382-016-3235-z, 2017. Peltier, W. R. and Vettoretti, G.: Dansgaard-Oeschger oscillations predicted in a comprehensive model of glacial climate: A “kicked” salt oscillator in the Atlantic, Geophys. Res. Lett., 41, 7306–7313, 2014. Rahmstorf, S.: Timing of abrupt climate change: A precise clock, Geophys. Res. Lett., 30, 1510, https://doi.org/10.1029/2003GL017115, 2003. Rasmussen, S. O., Bigler, M., Blockley, S. P. et al. : A stratigraphic framework for abrupt climatic changes during the Last Glacial period based on three synchronized Greenland ice-core records: refining and extending the INTIMATE event stratigraphy, Quaternary. Sci. Rev., 106, 14–28, 2014. Schulz, M.: On the 1470-year pacing of Dansgaard-Oeschger warm events, Paleoceanography, 17, 41–49, 2002. Svensson, A. et al. : The Greenland Ice Core Chronology 2005, 15–42 ka. Part 2: comparison to other records, Quaternary. Sci. Rev., 25, 3258–3267, 2006. Timmermann, A., Gildor, H., Schulz, M., and Tziperman, E.: Coherent Resonant Millennial-Scale Climate Oscillations Triggered by Massive Meltwater Pulses, J. Climate, 16, 2569–2585, 2003.